The 1.5-mile long Commercial/Imperial corridor is located at the heart of Southeastern San Diego, one of San Diego oldest and most diverse neighborhoods, with a dominant Latino population. Located just east of Downtown along a trolley line, the corridor is a tapestry of homes, artists, small stores and restaurants, as well as some of the last smaller-scale industrial uses in San Diego. Dyett & Bhatia completed the Master Plan for the corridor in Spring 2013. The Plan establishes a vision for the corridor as a distinctive community that celebrates the corridor’s diversity and culture. It identifies potential development opportunities, and higher intensity and mixed-use designations correlated with trolley stops. 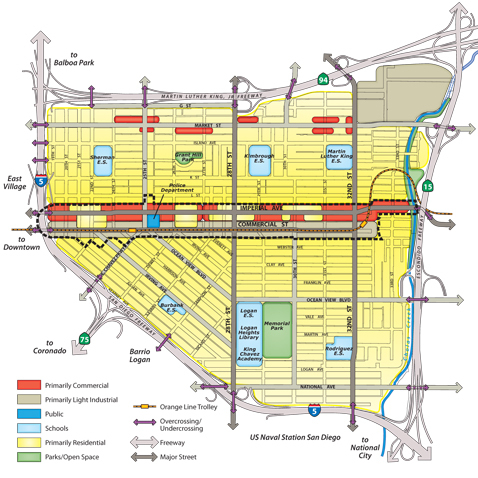 It also addresses potential collocation issues between industrial users and sensitive receptors; open space, jobs, and affordable housing; and development of a multi-modal transportation network. Plan preparation was accompanied by a comprehensive bilingual public outreach program engaging the community through workshops, Community Planning Group, a community character survey, and a project website. Recommendations of the Master Plan will be folded into the Southeastern Community Plan, also being prepared by Dyett & Bhatia under a separate contract.